The Xfinity Series, NASCAR’s second-tier racing tour, has a problem! The problem is participation by drivers from NASCAR’s top-tier tour, the Sprint Cup Series. Sprint Cup drivers regularly drop down a level and race in the XFINITY events. Most of those races are run on Sprint Cup weekends at the same tracks, a day before the top-tier race, so it’s easy to drive in both series. In the most recent XFINITY race, nine of the 40 starters were Sprint Cup regulars. Guess what? The Sprint Cup guys — with greater experience, better equipment and superior crews — win nearly all the XFINITY races! That is no surprise to the NASCAR fan. The Sprint Cup drivers are — as track promoters used to say — stinking up the show. Not too many years ago, Sprint Cup drivers were winning the XFINITY season championships as well. Sprint Cup drivers had won five consecutive season titles before 2011, when NASCAR changed its rules about championship points. NASCAR decreed drivers had to pick one series in which they could score points. The Sprint Cup regulars, of course, picked the top series. No more interlopers, double-dippers, buschwackers, whatever you want to call them, making off with XFINITY titles. But just because they couldn’t be season champs, Sprint Cup racers didn’t stop racing in the minor league XFINITY tour, didn’t stop taking home the winner’s purses, and didn’t stop hogging the victor’s glory. Sprint Cup regulars have won more than 75 percent of the 171 XFINITY races since the points rule was changed. The top five all-time XFINITY race winners are Cup regulars. 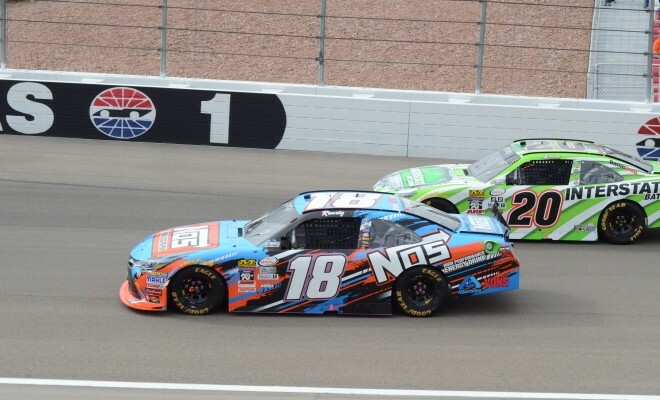 Kyle Busch is the runaway leader with 79 career wins. The top winner among the regulars in the second-level series is retired driver Jack Ingram, with 31 victories, quite a large difference in wins! Busch is a talented driver. Who would argue? He has won 34 Sprint Cup races and is the series’ defending champ. But dominating the XFINITY Series is not much different from having major league baseball’s home run champ drop down to Double-A ball and slug a few homers against pitchers at that level. Busch brought the problem into sharp focus Saturday at the Auto Club Speedway in Fontana, Calif., in the fifth race of the XFINITY season. Busch had won three consecutive XFINITY races before Saturday’s event and was dominating this one. He was cruising toward the checkered flag with no other driver challenging him when he blew a tire with about a little more than half a lap left in the race. He kept his car out of the fence and tried to nurse it to the finish line. But Austin Dillon, another Sprint Cup regular, passed Busch and took the win. Busch was angry. His blown tire had shed scraps of rubber and NASCAR had not waved a caution flag for the debris. A quick caution would have frozen the positions of the competitors. 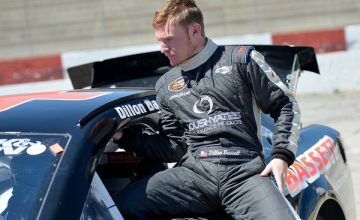 Dillon would not have been allowed to pass. The field would have trundled across the line in order and Busch would have extended his season-opening streak to five. Busch could get fined, as much as $50,000 for his childish radio transmission, however he was actually fined $10,00.00 for failing to media media obligations for finishing in the top-three. NASCAR has rules against disparaging remarks about the sport or its officials. “Fixing races” would seem to qualify as disparaging. Busch knows media and fans listen to driver-crew radio chatter. His comments were immediately played on the TV broadcast of the race. His fans will say his behavior shows his competitive fire. His detractors will say he needs to grow up! But never mind Busch’s personality traits and maturity level. His record on the XFINITY tour — 14 seasons, all overlapping his Sprint Cup career — is emblematic of what NASCAR needs to address. Conventional wisdom has been track promoters want the Sprint Cup drivers in their XFINITY races, all the better for marketing. However, it’s not working. Attendance and TV ratings for the series have sagged. At Richmond International Raceway, the races once drew crowds of 50,000 or more. The past few years, the crowds have been nowhere close, though the track hasn’t announced attendance figures. The sanctioning body needs to provide incentives for Sprint Cup drivers to become mentors for developmental drivers in the XFINITY Series. NASCAR needs to limit the number of XFINITY races allowed for drivers among the top 25 in the Sprint Cup point standings and to create a purse reserve available only to those drivers who have elected to run for XFINITY points. Most of all, Sprint Cup drivers — all of them, not just Busch — need to police themselves. 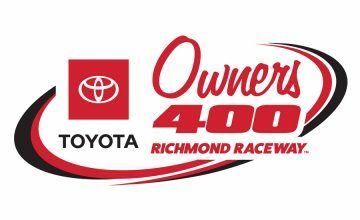 Maybe NASCAR needs to set a race limit that a Sprint Cup driver may participate in, say 10 races or 3 wins, and then you are done for the season in the XFINITY Series. It will be interesting to see if this issue is addressed either by NASCAR, or for that matter, by the double-dipping drivers themselves. Either way they need to quit stinking up the XFINITY show!